Jumpers Galore | I'm at my most comfortable when I'm snuggled under a duvet or blanket in a pair of PJ's, but as I can't really head outside like that, jumpers are the next best thing. They're super easy to wear with a variety of outfits and this Bershka Striped Jumper will look great underneath large coats too. Harry Potter | The magic of Harry Potter is the epitome of Autumn to me, I want to get out my wand and twirl it around daily. It becomes slightly more acceptable to re-watch the Harry Potter films as many times as you can before they appear on to your screens again in December for the Christmas period. Feeling More Inspired | If you're a regular reader of my blog then you'll know that the Summertime in one of the hardest times for me when it comes to motivation, especially nearing the end as I'm anticipating the colder weather and new releases. Now that it's officially a new season, I can get super motivated for brand new content and fresh ideas. 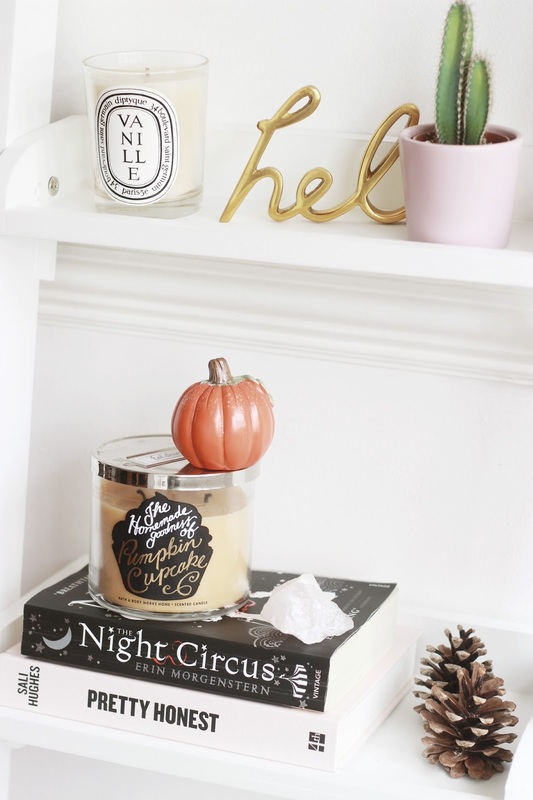 Candles Everywhere | Autumn is the perfect excuse to have at least one candle in every room - Am I right or is that just me? As someone who works from home, there's something quite comforting about a candle being lit as you're working away. Hunting For Conkers and Pinecones | I tend to go a little mad when it comes to pumpkins, conkers and pinecones this time of year, especially since having a fireplace and making the most out of displaying them. New Makeup Releases | I get so excited for new Autumn releases and the anticipation of Christmas ones too. They tend to be some of my favourites as the lipsticks are darker, the skin is glowier and it's more focused towards my sort of shades. Everything Feels Magical | As the Christmas chocolates begin trickling their way into stores, the Halloween decoration stands are being put out and the nights are drawing in, I can't help but think about all the magical times ahead. The ability to watch fireworks light up the sky in a rainbow of colours and looking forward to the Christmas lights being switched on in a couple months time. Crisp Morning Air | One of the smallest things about Autumn, but easily one of my favourites is the cold, fresh morning air that perks me up for the day and makes me feel refreshed. I also enjoy the windy days and still nights that Autumn has to offer too. Being A Homebody | I love nothing more than walking or cycling, getting slightly muddy and then coming back home to take a dip into bubble-filled Lush bath to warm myself up. Being a homebody is great at this time of the year as it means I have an excuse to do all of my favourite activities like taking up a new hobby, reading a book and pampering myself more.